Wilfried Elmenreich is Professor of Smart Grids at the Institute of Networked and Embedded Systems at the Alpen-Adria-Universität Klagenfurt. He studied computer science at the Vienna University of Technology and in 2008 received the venia docendi for technical computer science. In 2007 he moved to the Alpen-Adria-Universität Klagenfurt as Senior Researcher. After a visiting professorship at the University of Passau Elmenreich in 2013, he followed the call to the University of Klagenfurt. Wilfried Elmenreich is a member of the Senate at the Alpen-Adria-Universität Klagenfurt, Counselor of the IEEE Student Branch, and is involved in the master program on Game Studies and Engineering. 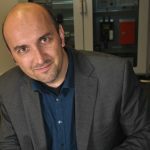 He is the publisher of several books and has published over 150 articles in the field of networked and embedded systems. Elmenreich researches intelligent energy systems, self-organizing systems and technical applications of swarm intelligence. Since the availability of programmable home computers, making computer games has become an achievable dream for gamers. Making a game, however, has always meant investing a tremendous amount of effort where people work on a project for weeks, months or even years. While game engines and game maker programs can help with this, the increasing complexity of computer systems has made it even harder to make a game in a reasonably short time. In recent years, game jams have started to break this habit by requiring teams to create a game prototype during one weekend. For instance, in the Ludum Dare game jam you are required to single-handedly produce all content, including assets, within 48 hours. But even faster paced game jams, like the weekly One Hour Game Jam, demonstrate that people are able to produce a small game prototype in around one hour. While these fast jams are definitely a great exercise for future game designers, they also teach us more: Firstly, they promote easy to use tools, which not only benefit the experienced speed coder but also the casual game programmer. They might not make a game in one hour, but probably making a game in half a day would be a great achievement for most people. Secondly, there is clear application in education, since typically month-long programming projects do not fit into common curricula, hourly lessons introducing a compact project with an interesting outcome is exactly what is needed to motivate pupils and teachers. Thirdly, while creating a small project in one hour may appears to be cowboy coding, it actually requires some software engineering skills to be able to identify the necessary steps to build a prototype and to properly identify a reasonable time budget for each part, like drawing, coding, level design and testing.